Blade number 32675 for 1894, so the blade was first in an 1892 Pattern and then rehilted into an 1895 pattern when the pattern changed (very common thing to happen as they both had exactly the same "dumb bell" blade). The blade bears the initials "P L I" which are for P L Ingpen of the West Yorkshire Regiment, as confirmed by the Wilkinson sales ledger for that serial number. The sword came from a museum sale, so we presume the later field scabbard to be correct and indicate that P L Ingpen wore the sword into and throughout WW1. He became Lt Col P L Ingpen, DSO and bar, commanding officer of the 1/8th Duke of Cambridge's Own (Middlesex Regiment), 1916-1918, seeing action at the battles of the Somme, (Passchendaele) Ypres, Scarpe and Arras, sitting as judge in at least one desertion military court martial where the accused British deserter was convicted and executed by firing squad. 32 inch blade in very good condition; it has been re-plated at some stage, so the etching is not as crisp as it once was, but is still very clear. Blade bears the Victorian royal cypher, British Royal Coat of Arms and the initials of the original owner. Blade is firm in the hilt. 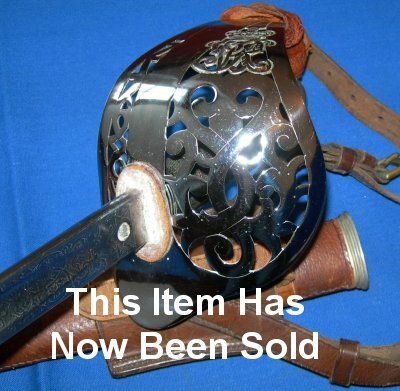 The hilt is in excellent overall condition. The fishskin grip and associated twisted grip wore bindings are very good,. but the grip has lost most of it black patent surfacing, as is to be expected (some people use liquid black show polish to "restore" the finish). 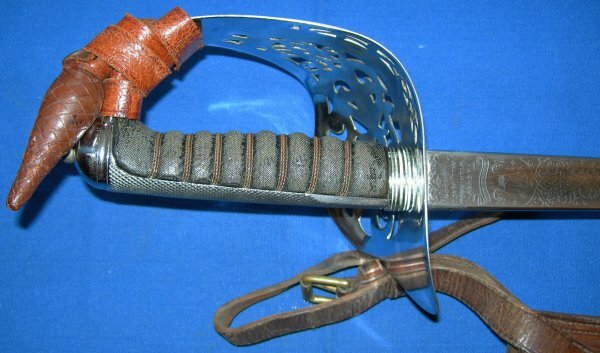 Complete with leather sword know, field service scabbard and frog. The sword sheathes and draws well.